If you happen to be in Tanjung Tokong area and want to have some cheap Western food, Faces Steak Garden is not a bad choice. There are quite a selection of food and the prices range from RM7.90 to RM17.90 at most. The restaurant’s lighting is minimal so the photos may appear blurry and do not look as good as it should be. 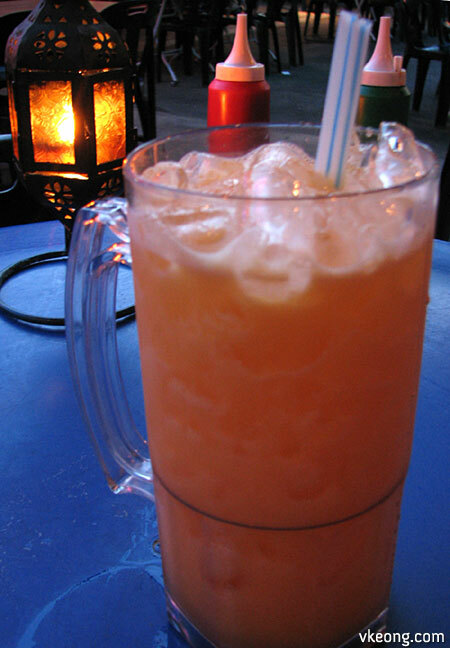 If you are having the meal with your partner I would recommend ordering the fruit juice at large size @RM5.50. It is definitely more than enough for two and more worthy compared to the normal size @RM3.50. The large cup is at least triple the size of a normal cup. We also felt we made the right choice hehe. 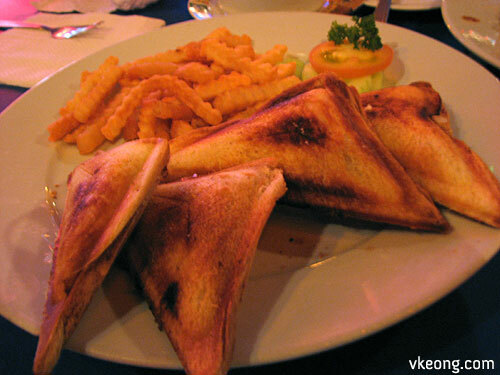 Jaffa’s Toast is the most expensive sandwich available for RM7.20. It is basically sandwiched pineapple bits, tuna, onions and some mayonnaise toasted using a sandwich maker. They taste good and can be treated as the main course due to its serving size. 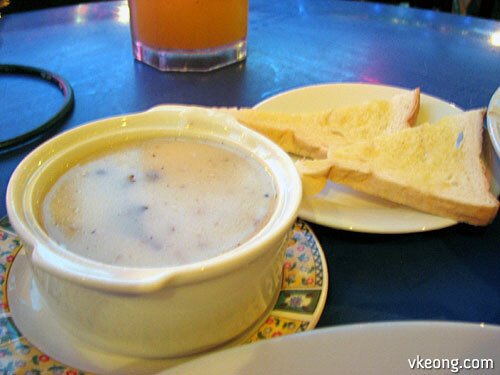 Mushroom Soup with toasted garlic bread @ RM4.50. OK only, and we found something “extra” in the soup.. a fallen tree leaf zzz. Also, it was quite laden with black pepper.. that’s the main reason I didn’t really like it. 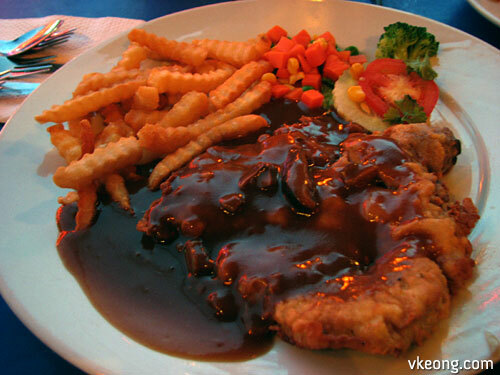 This was my main course that night, Mushroom Chicken Chop @ RM7.90. In Faces, most of the main courses here use black pepper sauce as the gravy. If you are a black pepper lover you will like it here. Anyway I like the mushroom sauce but the chicken was a bit soggy.. maybe it was not prepared upon order. 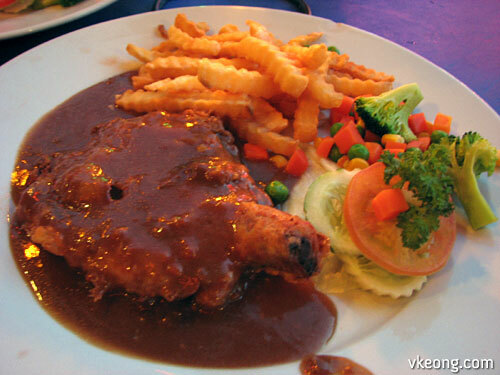 Siang Leng had Garlic Chicken Chop @ Rm7.90, which I actually felt was nicer than the mushroom one. Although the food here are not that fantastic, they are very affordable. Where else in Penang you can get a mixed grill of lamb, beef, chicken and seafood for less than 18 bucks? Faces Steak Garden is located right next to Hot Wok Nyonya cuisine restaurant along Jalan Tanjung Tokong, opposite the Caltex petrol station. There is live singing performance which starts around 8.30pm. And yeah sings well.